"A Waffle House will be built there. It's not a rumor. It will happen." City of Bellevue zoning administrator Scott Enns spoke confidently to city council earlier this month when he assured the community that Waffle House would be opening a new location on Donnermeyer Drive. The River City News first reported the possibility in June. The restaurant would be located on the site where a car wash currently operates. The car wash would be removed. Waffle House received the variance it needed from the city's board of adjustment related to the square footage along Donnermeyer in order to conform to the city's form-based code. "It's something we went through with Arby's," Enns said, referencing the lengthy process that that fast-food restaurant went through before developing a plan to conform to the code. It is also an issue that, among others, prevented Kroger from opening a new fuel center on the same site that Waffle House wants. And that puts Waffle House, which will need an easement for drivers to access the location through the grocery giant's parking lot, asking for permission from a company that was previously denied use of the site. Enns explained that restaurants like Waffle House are already a permitted use in the zone, but that fuel centers are conditional, and Kroger required many variances in order to proceed. The city's board denied Kroger. The City of Bellevue has worked with Waffle House for three months, Enns explained. "They have done a tremendous amount of work," he said. To access the site, the Waffle House proposal brings motorists through the Kroger parking lot. "The discussion has begun," Enns said. He expects no hard feelings from Kroger. "It comes down to, that was a conditional use, and (Waffle House) is a permitted use by right." The city is assisting with the Kroger request, he said. 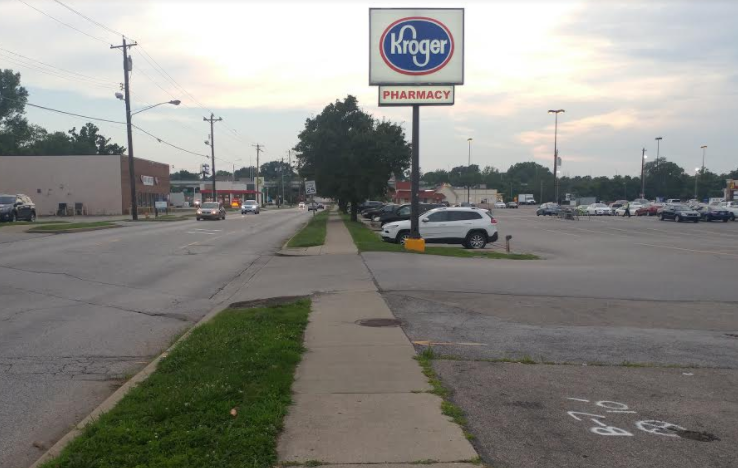 If Kroger denies the request, Enns said that access to the new restaurant would be a 24-ft. wide access point on Donnermeyer a mere 15-feet from another curb cut that grants access to Kroger. That type of development is not form-based friendly. "After ninety days, we'll review the site plan. If they are unable to do it, at some point we have to provide them access, but we want to exhaust this and we also want to get them to market." The Waffle House would also be a gain in the tax increment finance (TIF) district that the city created.